Our team continued to work like mad to field media inquiries and promote SXSW Cares / SXSW4Japan. The name stuck differently for different people -- but it was the same movement. Rob Wu (who wasn't available during our first interview) did an admirable job parallel tracking with me on all this -- but especially making sure his team kept our site up-to-date, adding features and functionality that extended the site socially, liaising with cause advocates to set up new fundraising pages under our site. He was also doing interviews, posts, shooting video and hustling all over with with me to interviews with the media and participation on two panels. He also coordinated on-site donation relief efforts with Japan Nite, Hurricane Party, The Etsy Party and other grassroots fundraisers who donated to the Red Cross in the name of SXSW Cares -- bringing together the community in a greater way. Some of them raised substantial funds, and we appreciated their desire to express solidarity as a SXSW Community. On her own time, Jessica Lin had helped us with - well, everything, but she was especially great at monitoring and managing the tweet streams and fielding incoming opportunities and requests. She did this while managing her work load with grace and style and she is one smart cookie. In parallel, Dr. Natalie Pethouoff took her own time to talk to companies on the trade show floor and procured several sizable donations from companies like RightNow (disclosure: client), GetSatisfaction and the Pepsi Refresh Project (among others). She paid out of her pocket for the cards we printed and circulated. She was also a driving force in our CNN coverage for SXSW Cares and SXSW4Japan. We were also joined by Denice Crowell, who worked sacrificially to create banners and help coordinate on-site activities on the music track as the Interactive session came to a close and everyone began to leave. 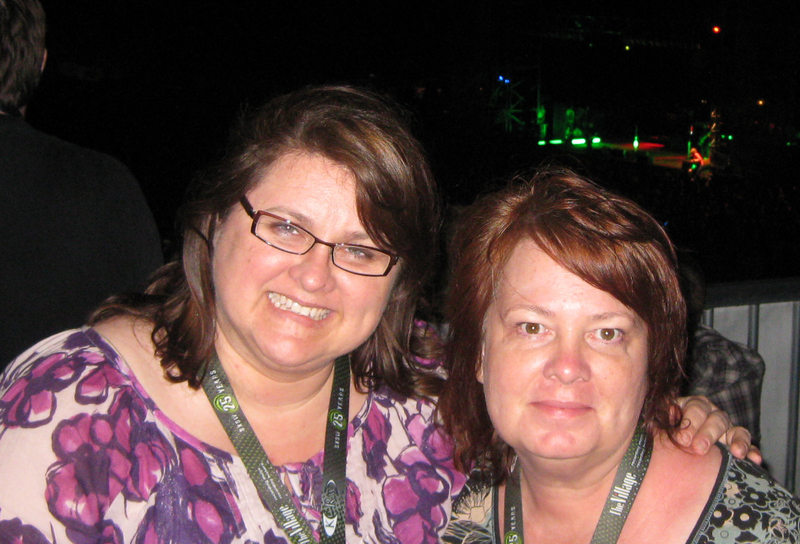 Denice was a tremendous help, and even drove us around when needed. Looking back, I'm not sure what I did, but the best way to describe it might be cat herding: Liaising between the Red Cross, SXSW leadership, City of Austin, brands, media, donors, organizing impromptu panel discussions, writing copy, tweeting (as I could), coordinating with volunteers and coordinating media releases, promotions and on-site outreach. I remember any of this, however, so I can't be sure. I do remember spending a lot of time. Waiting. Here. The SXSW Leadership team called me Sunday and asked if we could organize an impromptu teleconference and panel to be held in place of the full keynote scheduled with Bill Keller, Editor in Chief of the New York Times. I don't have any video of that right now, but Deb, Rob and I rallied and we were very honored to do this. Later we returned to the blogger lounge where we met up for a second time with Chris Noble who had been busy working to find donors as a tireless advocate for our cause. Laura Fitton joined him, and swung by to give us Samsung Galaxy Tab as a giveaway, courtesy of the 140 Conference. While we were working the lounge, we were asked to do an impromptu panel in the blogger lounge with Chris, Howard Greenstein and Drew Olanoff. It was a lot of fun. As you'll note from the footage, Samsung's own, local SXSW team also kicked in a sizable donation to help our cause, as they watched us work feverishly together in the lounge. This was over and above the incredible pledge Samsung has made toward the devastated country of Japan. The Samsung team was awesome to us, along with their PR team from Weber Shandwick and we can't thank them enough. 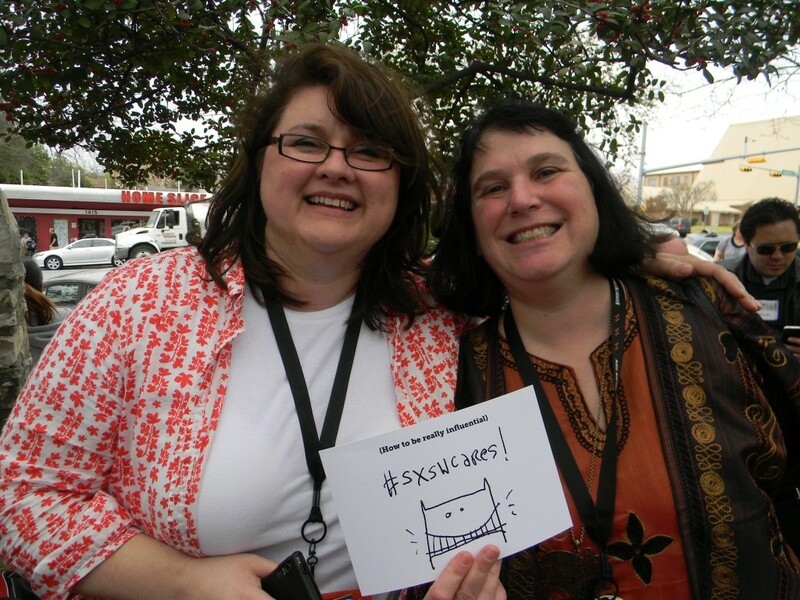 On the 15th, the leadership at SXSW donating badges to award for specific donation amounts. Just prior to making an announcement in the lounge, I met up with Joseph Jaffe, author of the best-seller, "Flip the Funnel." As a prior advocate for fundraising for Haiti, Joseph generously volunteered (on the spot) to auction off keynote engagements with all proceeds going to SXSWCares. There's one remaining keynote being auctioned. The first one went for $15,000. Thank you, Joseph. Over the days that ensued, we were actively promoted in posts, tweets and panels by an incredible (and impossible to count) community of smart people, including Brian Solis, Guy Kawasaki, David Meerman Scott, Stephanie Agresta, Drew Olanoff, Ann Handley, Mack Collier, Valeria Maltoni, Kellye Crane, Ekaterina Walter, Shelly Kramer, Beth Harte, Geoff Livingston, Kami Watson-Huyse, David Armano, Aaron Strout, Meghan Scibona and so many others I can hardly count. (If I forgot you, please forgive me, I'm only now catching up on things -- as well as sleep). In short, the collaboration and teamwork have been simply amazing. Our team continued to promote our cause on the floor and with the media. With SXSW's help, we also set up a Red Cross/SXSW Cares booth at the large venue concerts at Auditorium Shores. We also partnered with the Mayor's office during the Mayor's Reception to kick off SXSW Music and did promotion on the KGSR Live Broadcast from the Four Seasons. By last Saturday (March 19th) morning, we'd raised about $83k for the Red Cross Earthquake and Tsunami Relief. On Friday afternoon, I got an email from Hugh asking me if we could connect with Hanson Music. Zack, Issac, Taylor (Members of the Band, Hanson!) and Rebecca were organizing a live, streaming 12 hour (!!!) music telethon that featured some of the most awesome bands and artists at SXSW. Rob arranged to host the stream on our site, they announced at the Four Seasons and printed flyers and started the stream around noon on Saturday. It ran until midnight. In the middle of doing press, packing to leave and nearly missing my flight, I only caught the beginning. I got in around 10pm and caught the end. It was really impressive. Steady stream of great bands and artists - all coordinated out of a small studio in Austin. Catching the tail end, I was delighted to watch Ozomatli tear it up -- and Ben Folds' customized "how to text the Red Cross" demo and entertaining musical antics. Check out the Flickr set by the talented Jeremy Charles here! Working with the Hansons has been terrific and the telethon proves both (proving both their resourcefulness and their talent) and we are delighted to have partnered with them in this endeavor. It was a big success, and went far toward our goal of uniting the music community around Japan and reaching our goal of $100k in online donations for Japan. Note: Since the broadcast, we've been talking and we're happy to announce that we'll be re-streaming this broadcast (with a host of other little surprises) very soon. So, please stay tuned for more announcements! So.... that's what's been happening here. It's so bizarre, looking back. Rob and I figured we could raise an easy $10k for the Red Cross. We hit that goal in two days. We just kept raising the bar, and people kept giving. Today, we're at $105k with an additional $35k in commitments. Incidentally, Our donation counter doesn't include the money raised via text donation to Red Cross at 90999. Those donations are received directly by the Red Cross and are difficult to track. 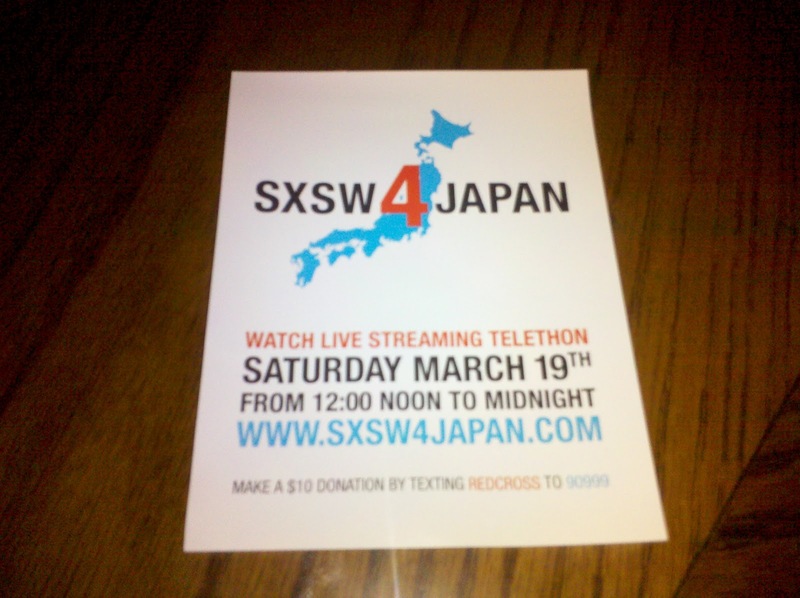 However, we did hear from the Red Cross that last weekend alone (16-17th) the Red Cross attributed more than $400,000 in text donations as a result of SXSW4Japan. When I got home after 10 days in Austin, I was welcomed by the smells of home, the hugs and kisses from my attention deprived three year old, beautiful step daughter, my super supportive husband and our ever faithful, ball-obsessed Labrador Retriever. As I hugged them all, it was a sobering reality to consider how many people in Japan and other devastated areas are now deprived of such a homecoming. We have so much we can easily take even the smallest comforts for granted. My prayer is that God will prick our hearts and help us all understand. We encourage you to give -- your time, your talents, your money. Do it wisely - as there are some parties skimming 15% or more off the top of donations right now! Please keep in mind that 100% of online donations go directly to the American Red Cross Earthquake and Tsunami Disaster Relief fund for Japan. As far as SXSW Cares / SXSW 4 Japan -- we're still taking donations online and will be making more announcements soon. SXSW - Hugh Forrest and Kevin Connor who offered unparalleled personal and professional support, advocacy, promotion, displaying zero ego in the process. It was an honor working with them. Red Cross - Nina Lior, Marty McKellips, Debbie Immel and Stephanie - you were all terrific and ultra responsive. Thank you! Thanks also to everyone who tweeted, re-tweeted, clicked, donated, volunteered, wrote blog posts and offered words of encouragement to our team in this endeavor. Personal thanks to my family, especially my Cousin Lance Ray and his beautiful wife, Amy. They are two of my favorite people in the world and let me come in and out of their home at all hours of the night and day as their dogs barked protectively and woke them up. If I've forgotten ANYONE please let me know. Winded, overwhelmed, blessed and grateful. I'm admittedly behind on posting and I apologize. Lots of good work going on at Live Path, and travel has also beckoned. This week, I find myself at sxsw doing some client work and meeting up with some of the best and brightest minds in digital/interactive. However, I have found myself distracted and deeply saddened by the news from Japan. Turns out, I'm not the only one. Early on Friday, I stopped into the Blogger lounge and met up with digital pal and Blogworld Expo diva, Deb Ng. We talked about how surreal it was carrying on our lives when people's lives were being literally wiped away in Japan. I told Deb, "We oughta start a hashtag - like 'sxswcares' and drive donations to the Red Cross." Deb loved the idea, and a movement was born. We began pushing people to text donations to 90999 (Red Cross) and planning our next steps. I reached out to media relations and the Red Cross and working toward getting a site setup. Buzz began to spread around the blogger lounge and we had tons of leading bloggers, PR experts, social media specialists and technologists spreading the news on our hashtag. About an hour later, I heard from Jessica Lin about Rob Wu, who (in parallel) had started a #sxsw4japan hashtag and donation site on the same track as us. I asked him to meet me in the Samsung Blogger Lounge and pooled our resources, using his platform, CauseVox to build a website to direct donations to the Red Cross. It was such an awesome collaborative experience. It turns out that in addition to having the same terrible feeling when we woke up Friday - we'd both had training with the American Red Cross AND we had highly compatible skills. We decided to unite the efforts. As I continued to talk to the Red Cross and write copy to tweak the website... Rob procured domain names and started with a new logo that we coerced Hugh McLeod (Gaping Void), to create on the fly. I wrote copy and got a finalized the partner agreement with the Red Cross for Rob to sign (running things through CauseVox) while Deb circulated and told people about the movement and stimulated some great buzz. We worked ambitiously all day and launched the sxswcares website (sxsw4japan) officially at 6:30pm. Before we launched, we had driven the donations on our site alone from about $600 to about $2k in donations. In just 24 hours, we have generated more than $7k in donations. On Friday night, during interviews for the Statesman... We created some sxsw cares cards and are circulating them, and watched mentions in posts, articles and tweets at the hashtag #sxswcares skyrocket on Twitter. Since then, we've all continued to work proactively and inclusively in a joint initiative to drive support for Japan. While we can't track text donations to 90999 - we are tracking donations on our site and working on corporate matching grants. We will surpass our goal of $10k - I'm hoping to double it. I hope you will help. UPDATE - We are now over $12k in donations and it's not slowing down. More announcements from our partners tomorrow!